Born in Germany, Winold Reiss grew up in the Black Forest and came to be a foremost American painter of Indian portraits. He is also considered a modernist, a part of the Art Deco vanguard. In Munich, he studied at the Royal Academy and the Art School, and having been impressed by novels of James Fenimore Cooper, came to the United States in 1913 with the purpose of painting Indians like those he had read about. He arrived in New York City with little money and realized he was still a distance from Indian country, so he first got established as a portrait, landscape, and mural painter, art teacher, and interior designer. In the latter capacity, he successfully decorated several restaurants and other public buildings and had a commission for the Hotel Crillon. All of this activity allowed him to save money for travel. 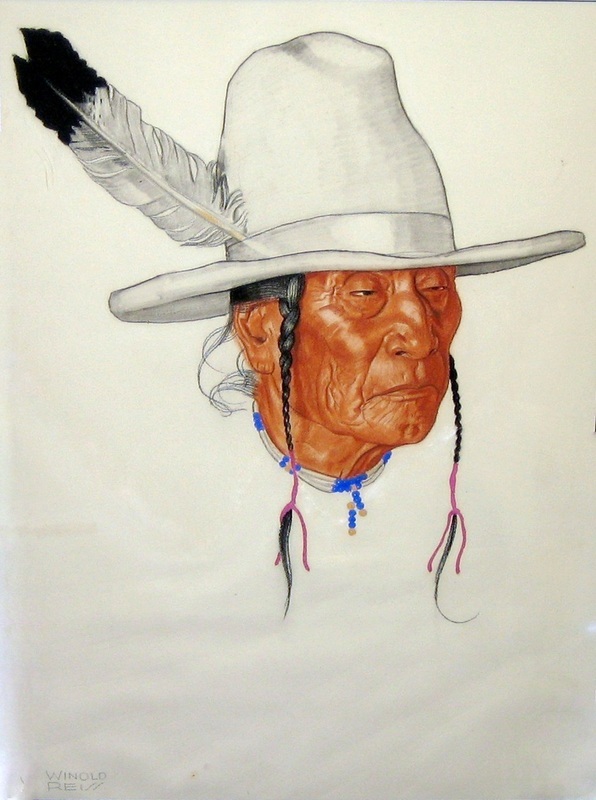 In 1919, he went West, visiting the Blackfeet Indians who made him an honorary member of the tribe, naming him "Beaver Child." He returned to their reservation in Browning, Montana most summers between 1920 and 1940 while continuing to live in New York. Eighty one of his portraits were published by the Great Northern Railway. Also during the 1920s and 1930s, he painted many scenes of Harlem, during the creative period known as the Harlem Renaissance. In 1939, he completed, what was then, the world's largest mural for the New York World's Fair. Also he ran art schools in New York City, Woodstock and Glacier National Park. In fact, he spent many summers teaching at Glacier National Park and at that time, was probably the state's leading art teacher. He painted other western scenes including the Grand Canyon. and he gave lectures on color and mural painting. His technique was to work quickly on a large sheet of Whatman Board with pastel and tempera, media that dried quickly so he could quickly finish his portraits. Often the elderly Indians would fall asleep, so he would fill on the decoration on their clothing later. He often used motifs from the Indian crafts in the background of his paintings.